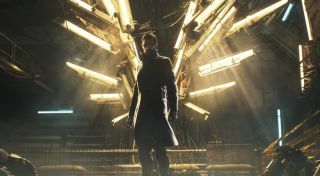 Pre-order schemes don't have the best reputation with PC gamers, and this one for Deus Ex: Mankind Divided seems likely to raise some eyebrows. The game's release date was announced earlier today as being February 23, 2016. However, if enough people preorder, it will actually be come out on February 19. This is the final flourish of Square Enix's tiered preorder campaign, which promises various sorts of bonuses in exchange for hitting preorder goals. There are five tiers in the "Augment Your Preorder" program, each containing items that can be selected as a preorder bonus. The first tier, for instance, includes the Intruder Pack, Enforcer Pack, and Classic Pack, each with various sorts of in-game equipment aimed at supporting a particular style of play. The second tier offers the choice of a digital art book or a soundtrack "sampler," the third tier is a bonus mission, and the fourth tier is a digital comic book or novella. But it's the fifth tier that's really interesting. If enough people preorder, Deus Ex: Mankind Divided will be released four days early. That indicates some really solid confidence in the announced launch date, but it could also be seen—and is being seen, based on a number of reactions on Twitter—as gaming the system. The only way Square could reasonably guarantee an early release date is if the date it announced is intentionally pushed back from the actual ready-to-go date. The "you won't get this content if you don't preorder" threat (which, let's face it, is what this is) rings hollow too, since all this bonus stuff is already guaranteed for the retail collector's edition, which "will include all the in-game content and rewards from Augment Your Pre-order." I haven't seen any indication of how many preorders are required to hit each tier, and so I suppose it's possible that Square Enix could goose the progress bar, if necessary, to make sure that all the preorder bonus options are available to everyone. After all, I can't imagine even the most tone deaf marketer seriously suggesting that a company dangle and then withhold content because consumers didn't throw enough money at it up front. But the mere possibility that it could happen is bad enough: I loved Human Revolution and I'm hot-hot-hot for Mankind Divided, but I can't get behind a program like this. Sorry, Square.